Today, the Morgan Silver Dollar Coin remembers when the St. Paul, an American liner, launched out of Philadelphia on April 10, 1895. The New American Steamer St. Paul. No more successful launching of a large vessel was ever effected than was that of the new American liner St. Paul, from the Cramps’ shipyard, at Philadelphia, April 10. This was especially gratifying because of the failure to effect the launch some two weeks ago, as was first intended, causing great disappointment to a great crowd which had then assembled to do honor to the occasion. The first failure was attributed to the poor tallow, but there was no fault of this kind the second time, and the tallow was mixed with lard oil and steamed just before the launch. It has been asserted that the vessel was heavier the first time than she should have been, but this was effectually answered by the fact that the builders continued to put in weight instead of taking it out. Up near the bow, one side of the cradle had sunk two inches, two weeks ago, under the pressure of the jack screws, and the ways were shaped to allow for this settling. It was intended the launch should take place at 2:30 p. m., but a freshet in the Delaware brought high water earlier, and at 12:15 p. m. was heard the “rally” of the four hundred men who had been told off as wedgers, as they lifted the vessel from the keel blocks by pushing up the launching ways against her. In five minutes more the men were heard cutting away the keel blocks, and soon the vessel commenced to glide down the ways, keeping the same pace nearly all the way. As she started, the usual christening bottle was broken on her bow by Miss Frances C. Griscom, a sixteen year old daughter of President Griscom, of the International Navigation Company. The vessel was towed back to the yard within twenty minutes. They are the largest vessels ever constructed in America, their principal dimensions being: Length over all, 554 feet; length on load water line, 536 feet; extreme breadth, 63 feet; moulded depth, 42 feet; tonnage, gross register, 11,000 tons. The hull has a double bottom constructed on the cellular principle, subdivided by athwarthship bulkheads and a longitudinal division arranged for heeling purposes, the whole available for water ballast. It is so subdivided by transverse bulkheads that even in the event of a collision and injury to a bulkhead, whereby two compartments might fill with water, the ship would still float in perfect safety. It has a straight stem and elliptical stern, topgallant forecastle and poop, with close bulwarks fore and aft, and promenade, saloon, upper, main and orlop decks, the three first named to be plated from end to end. The main deck will be plated for the length of the machinery spaces, and will have stringers and tie plates beyond. Wood planking will be laid on all decks. The promenade deck will remain unbroken the whole length of the vessel. The vessel will carry about 320 first-class and 200 second-class passengers and 900 emigrants. The engines are quadruple expansion, designed to develop 10,000 I.H.P. each. The cylinders are 36, 50, 71, and 100 inches respectively in diameter, with a piston stroke of 60 inches, two sets of engines turning twin screws, which will be sectional, with three blades. Steam for the working of the main engines will be furnished at about 200 pounds pressure by six steel double-ended boilers, each 20 feet long and 15 feet 7.5 inches diameter. To comply with the terms of the contract, the builders will have to show, by an extended sea trial, that when working under ordinary sea-going conditions the vessel is easily capable of maintaining a speed of 20 knots per hour at sea. The St. Paul, as well as the St. Louis, has been especially arranged to be readily and quickly convertible into an armed cruiser of the United States government, in which capacity she will carry a number of six-inch rapid fire guns. Vessels Prove Value to Navy. The St. Louis and St. Paul showed their value as naval auxiliaries and achieved some brilliant exploits in the Spanish-American war, they being taken over by the navy as scout cruisers in accordance with their government contract. On May 18, 1898, the St. Louis, commanded by Capt. Casper F. Goodrich, of the regular navy, grappled and cut, off Santiago, the cable to Jamaica, which gave Capt-Gen. Blanco communication with Madrid. The cable was brought up from deep water within 2,500 yards of Morro castle, while the Spanish gun and mortar batteries played fiercely upon the unarmored merchantman. On June 22, 1898, the St. Paul was attacked beyond Porto Rico by the Spanish cruiser, Infanta Isabel, and the 30 knot torpedo destroyer Terror, which had parted company off Martinique a month before with Admiral Cervera’s squadron. The Terror drove straight at the St. Paul to blow her up. Capt. Sigsbee, of the lost Maine, who commanded the St. Paul, opened with his 5-inch rifles at 5,400 yards. A few shots gave the Yankee gunners the exact range, and a storm of 50-lb. shells fell upon the Terror, crushing her machinery, killing her chief engineer and several of his men. The shattered destroyer fled for the harbor and was dragged upon the beach to save the torn hull from foundering. 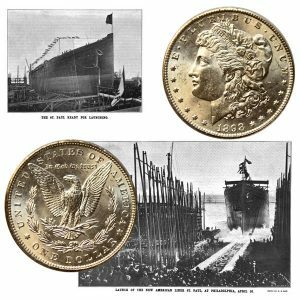 The Morgan Silver Dollar Coin shows with an image of the American liner St. Paul being launched on April 10, 1895.